Huntingdonshire District Council last night confirmed Resolution to Grant on an Outline Planning Application for a new urban extension at St Neots, Huntingdonshire. The application for Wintringham – part of the Eastern Expansion plans for St Neots – was submitted jointly by Urban&Civic and trusts associated with Nuffield College, Oxford. The site is established as a location for development in Huntingdonshire’s Adopted Core Strategy (2009) and is part of the St Neots Eastern Expansion Urban Design Framework (2010). The proposed extension, includes, up to 2,800 new homes, two new primary schools, health facilities and 63,000 sq metres of new employment space. The application was submitted on 30th October 2017, meaning determination took place within 20 weeks. 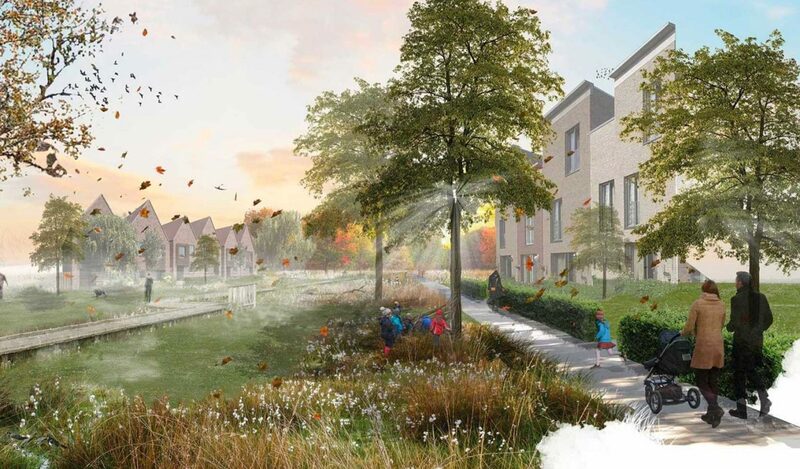 Terms have already been agreed for the first housebuilder to start work on the project, under Urban&Civic’s bespoke Master Developer licence model, and an application for the early infrastructure was also approved last night. The target for first occupations is by the end of 2019. “We are committed to bringing forward Wintringham as a high quality place to live and work, and as an exciting gateway to the East of the dynamic town of St Neots. We will continue to work with the District and Town Council, and local residents and partners as we bring forward this application into detailed design and delivery, and we will work them to minimise the impacts and maximise the benefits this development can bring the wider area. Rebecca Britton, 07739 339889, rbritton@urbanandcivic.com or contact us. The application consists of an Outline Application for the development as a whole, as well as the detailed infrastructure for the first phase, as a commitment to bringing forward early infrastructure and facilities as part of the first phase of development. 63,500 sqm of commercial space, including R&D and creative space, as well as office and industrial units. 2 primary schools, with the potential for a temporary primary school to address immediate issues locally. Community and retail facilities focused on a local and district centre, including health care. Access improvements including capacity improvements, new access and landscape setting along Cambridge Road, and access points on to the A428 and Potton Road. The site is established as a location for development in Huntingdonshire’s Adopted Core Strategy (2009) and is part of the St Neots Eastern Expansion Urban Design Framework (2010). In 2013, it was subject to a planning application by a former consortium, which was refused and subsequently appealed. The appeal was withdrawn in May 2017 and the consortium disbanded. Since then Urban&Civic has bought into the landowning partnership alongside long term owners, the Nuffield Trusts, and been appointed Development Manager. The team has been working through the feedback by and with statutory partners, local groups and residents to evolve the proposals and develop an aspirational vision which draws extensively on the historic brooks that cross the site, the connections with St Neots, Loves Farm and the surrounding area, and puts green space at the heart of the design.